There’s an awful lot to like about Canadian April Verch’s tenth album, “The Newpart”. It has a warm and authentic roots feel while incorporating influences from country, traditional, blues and jazz seamlessly into a cohesive piece of work. With the assistance of Hayes Griffin (guitars), Cody Walters (upright bass and banjo), who both turn in exemplary performances, and producer Casey Driessen, she has pulled together an album which celebrates and pays tribute to her influences while showing us how those influences have developed her own style. The album’s opening track is the instrumental, “Belle Election”, which sets the tone for the album perfectly. The playing is spot on and it’s a great uptempo opener for the set, which has another four instrumentals. “Cruel Willie” and “Midnight Wheeler” are (mainly) traditional North American pieces, “Polska from Kumla” is traditional Swedish and the title track is an April Verch composition which is a tribute to the area of her parents’ house where the family gathered to play music. There’s some honest-to-goodness fun on the album as well; Lew Childre’s “It Didn’t Do Nothing but Rain” and John Hartford’s “Bring Your Clothes Back Home” are all about having a good time, the latter showcasing April’s voice, fiddle and step dancing. And that leads me to my only criticism of the album. I’m not convinced that “Gilchrist”, which is purely step dance works as an album track; I think it needs the visual context to make it work. I’m sure the purists will disagree and I know there’s a certain element of irony when this criticism comes from someone who’s trying to write about music but it just doesn’t do it for me: sorry. The country songs all work well; Hod Pharis’s “I Heard the Bluebirds Sing” has lovely high harmonies and call and response vocals, “It Makes No Difference to Me” (written by April and Cody Walters) is subtle and poignant and Seger Ellis’s “Montana Call” has a delicate, ethereal quality enhanced by the jazz-inflected guitar. And any song that mentions whippoorwills will always push my country buttons. Don’t ask me why, it just will. “If You Hadn’t Gone Away” is a twenties torch song with some neat jazz guitar stylings and the album closes with the traditional spiritual “Dry Bones” and April’s hauntingly beautiful “This Melody”, which is about the beauty of music as a means of expression. 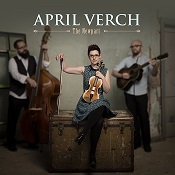 April Verch has selected a disparate group of songs and stitched them together around her vocals and fiddle to create a very listenable album. “The Newpart” is out on April 20th on Slab Town Records (STR15-01).